“For the last 15+ years I have been a professional speaker, trainer and consultant. I work with multiple organizations in various industries in helping them to increase their sales to explode their bottom line profits. My areas of expertise are sales, sales marketing, sales management, sales motivation and creating a superstar life. I entered the sales field at nineteen and became one of the youngest executive managers in the country at twenty seven. I have spoken to thousands of audiences, published hundreds of articles and newsletters and have been interviewed in numerous magazine and newspapers as well as appearing on a top ranked satellite training network for several years. Mark Tewart is a renowned expert on sales, sales marketing, sales management and creating a high performance life. Mark is a motivational speaker, consultant, coach, entrepreneur and owner of four businesses, and author of “How To Be A Sales Superstar – Break All the Rules and Succeed While Doing It” published by Wiley which is available in book stores and Amazon. Mark has spoken to over 2,000 audiences in the last fifteen years. Also, Mark has published hundreds of articles in numerous trade magazines and authored numerous books, audios, videos and online training materials. Mark has had a top ranked Satellite TV show and been interviewed by magazines, newspapers, radio and TV shows across the world. 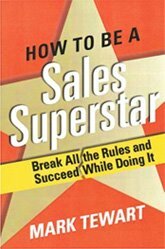 To read the first chapter of How to be a Sales Superstar and to receive several FREE bonuses from Mark Tewart, visit www.marktewartlive.com.